You know there’s trouble when they come to take away the water coolers and for this business that trouble is terminal. 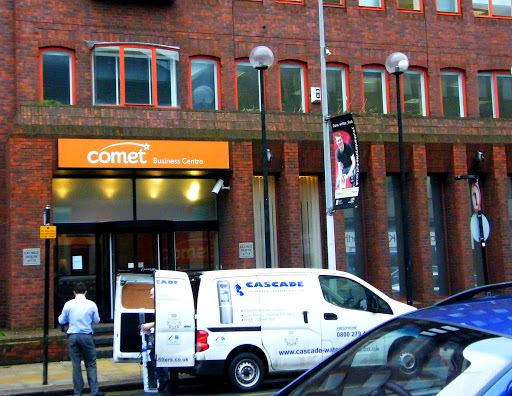 For today Comet’s Business Centre finally closes and the last remaining twenty or so employees lose their jobs. 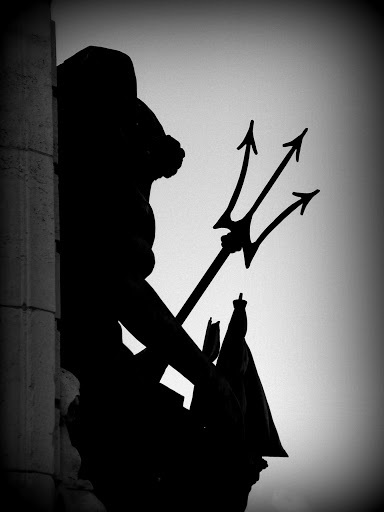 Comet was founded in Hull in 1933 and used to employ nearly 7,000 people nationwide with over 500 in Hull. There’s to be an investigation into the insolvency which has left many firms out-of-pocket by millions of pounds. Somebody once said “Capitalism without bankruptcy is like Christianity without hell” maybe so but when a Christian sins he only takes himself down not 7,000 others. Watergate, how one thing leads to another. 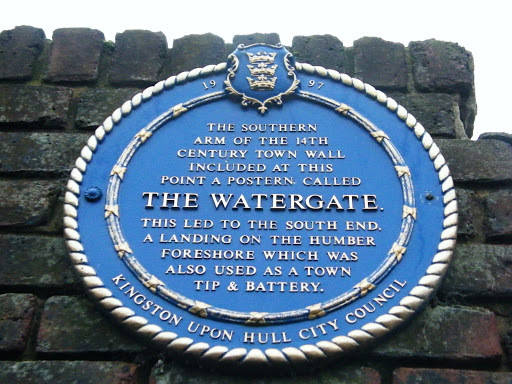 I’ve walked down Humber Street a number of times but only today noticed this blue plaque; it’s right next to that old dry dock that I posted a few weeks back. I suppose they put plaques high up so no-one will steal them still it defeats the purpose if you don’t see them at all. 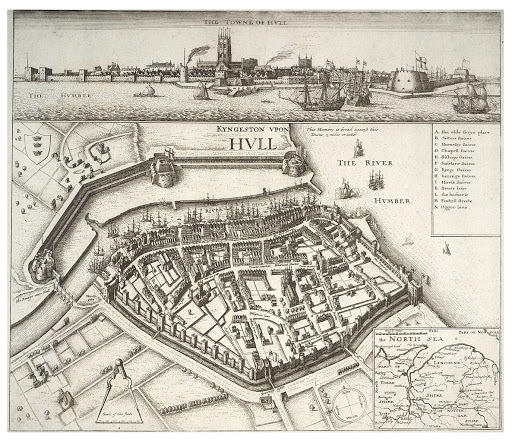 Anyhow inspired by a sign to an old rubbish tip I looked up Hull’s Watergate and found an old picture/map of Hull by Wenceslas Hollar (1607 -1677). I thought the top bit of the picture would make a good heading for the blog and while I was fiddling with that I changed the background colours as well and before I knew it the blog had a brand new look. If you’re interested the Watergate is shown right in the middle of the picture. Below is the full image, the date is unknown (thanks to Wikimedia Commons). 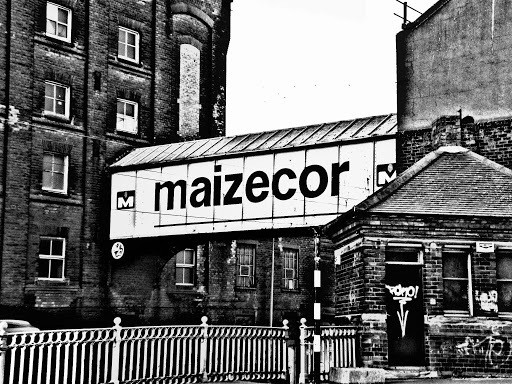 Some moths ago I showed the Maizecor tower an impressive concrete structure which is way off to the left of this picture. When the business started grain would be shipped up the river and offloaded into the large building on the right before crossing over Wincolmlee to the processing plant via this bridge. It’s no longer in use as far as I know. Also no longer in use is the Scott Street bridge control building on the left. 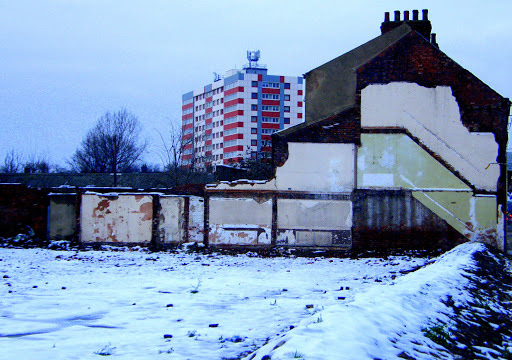 If you’re familiar with Hull you’ll know where this is. If not it doesn’t really matter. It’s just a piece of Edwardian claptrap celebrating Empire and Majesty and all the crud that goes with it. Fitting then that it sits on top of the public convenience. The Punch was originally built in the 1840’s ( see old photo here ) but was demolished and rebuilt in grand style in 1896. The exterior is covered in ceramic tiling to give a highly decorative effect. It sits on the corner of Queen Victoria Square between the Ferens art gallery and Carr Lane’s 20th century excrescences. OK what can I possibly say about this? In December 1868 the world’s first traffic lights came into operation near Westminster Bridge in London. They were gas lit and unfortunately within a month had sprung a leak and blown up resulting in the policeman who was operating them suffering severe burns and, according to some sources, dying from his injuries. 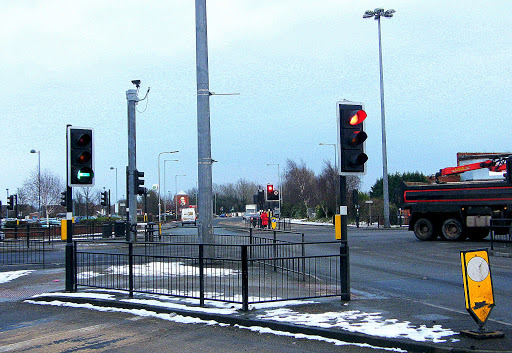 Things have moved on a bit and now there must be millions of these devices at junctions all across the world. There’s a fair few here at the junction of Holderness Road and Mount Pleasant. There’s precious little to say about this junction except that it’s oft times busy and the sooner you can get away from it the better. I’m sorry I can’t imagine what I was thinking taking such a dull picture and inflicting it on the world. If celebrating Australia Day (or Invasion Day if you wish) tickles your fancy then some City Daily Photo bloggers are posting about this here. Six months ago I posted that this block was due for demolition and it seems that half the job has been done. The remaining buildings are still trading with a pawnbrokers and a kebab shop carrying on as if nothing has happened.When they say they’ve levelled the site they mean it!